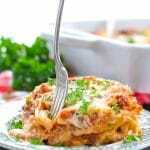 Every home cook needs an amazing lasagna recipe in her back pocket, and this is the one to keep! 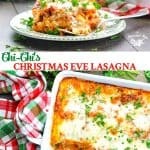 It has become a Christmas Eve tradition in our family, but it's a perfect make-ahead dinner for just about any occasion! 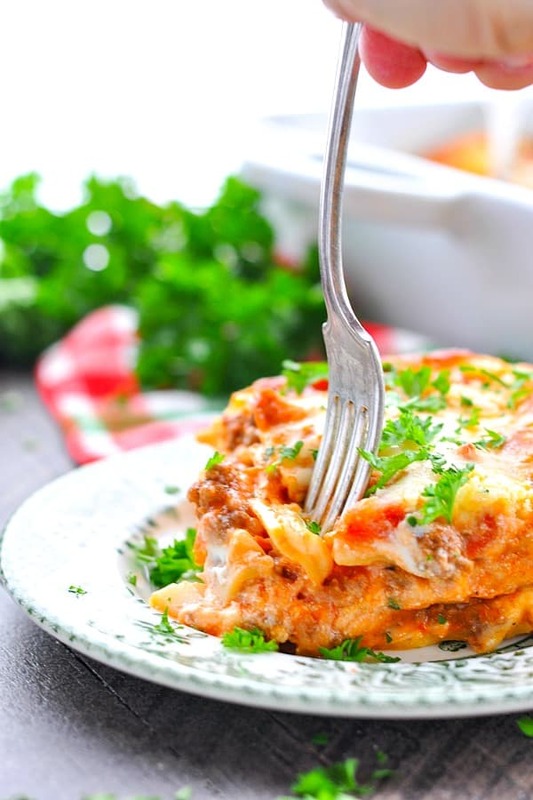 Every home cook needs an amazing lasagna recipe in her back pocket, and this is the one to keep! It has become a Christmas Eve tradition in our family, but it’s a perfect make-ahead dinner for just about any occasion! 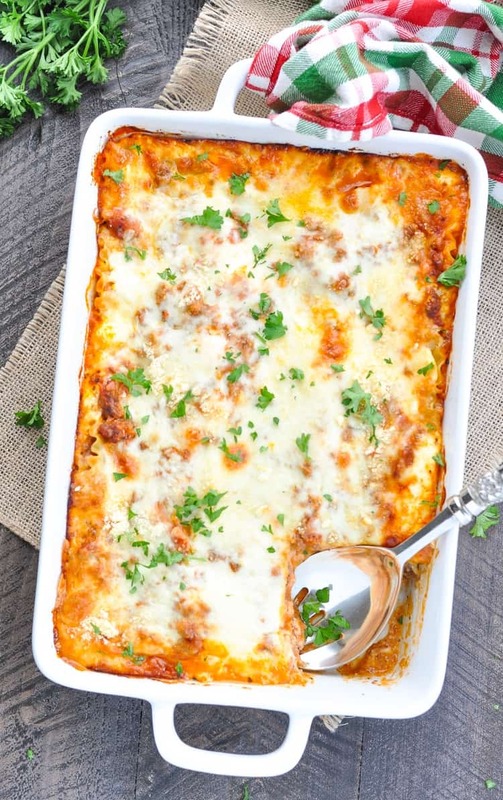 My mother-in-law has a few secret ingredients that make this easy lasagna recipe so special, and I’m sharing them all with you today! Aren’t holiday traditions the best? Whether it’s the food, the activities, or the decorations, the familiar customs that we look forward to each year are by far my favorite parts of the season. 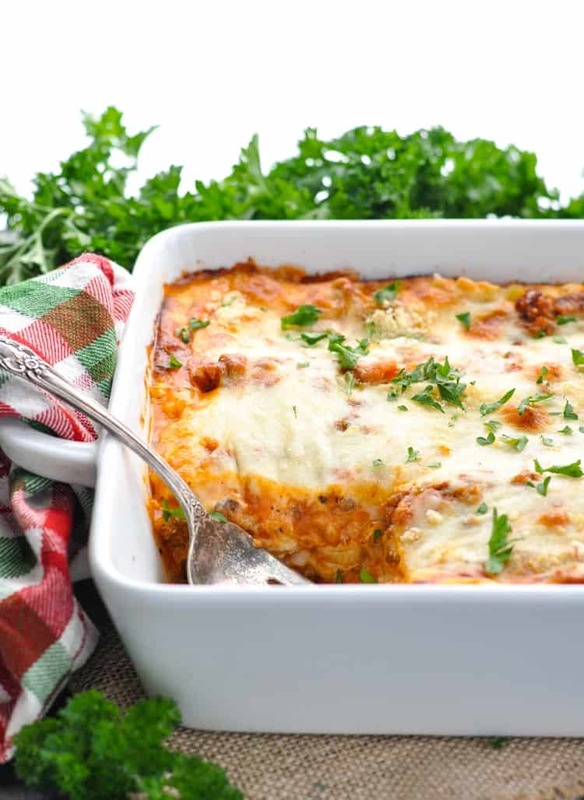 While this lasagna recipe is easy enough for just about any family supper, it’s also the dinner that my mother-in-law (known as “Chi-Chi” among the grandchildren) serves every year on Christmas Eve. It’s perfect for a holiday or special occasion because you can prepare the dish entirely in advance, and then just bake it in the oven when your guests arrive. This way, Chi-Chi can focus on the stockings, unwrapping the gifts with the kids, and enjoying the evening with family. Plus, all of the little ones devour this lasagna recipe, so it’s a guaranteed crowd-pleaser for guests of all ages! What makes Chi-Chi’s lasagna recipe so darn special? Maybe it’s the love that goes into it? Or maybe it’s the spirit and excitement of the season? 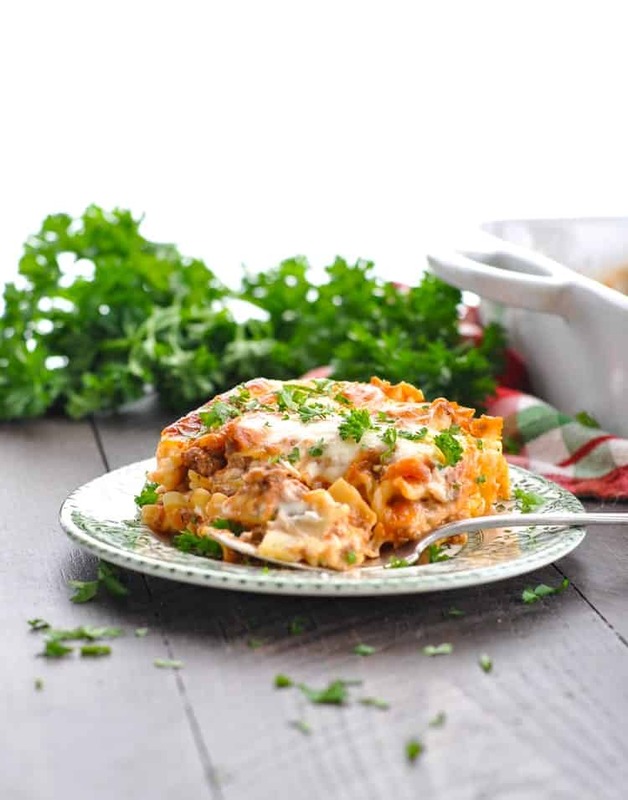 I can vouch for the fact that this traditional lasagna recipe tastes amazing at just about any time of year, though! 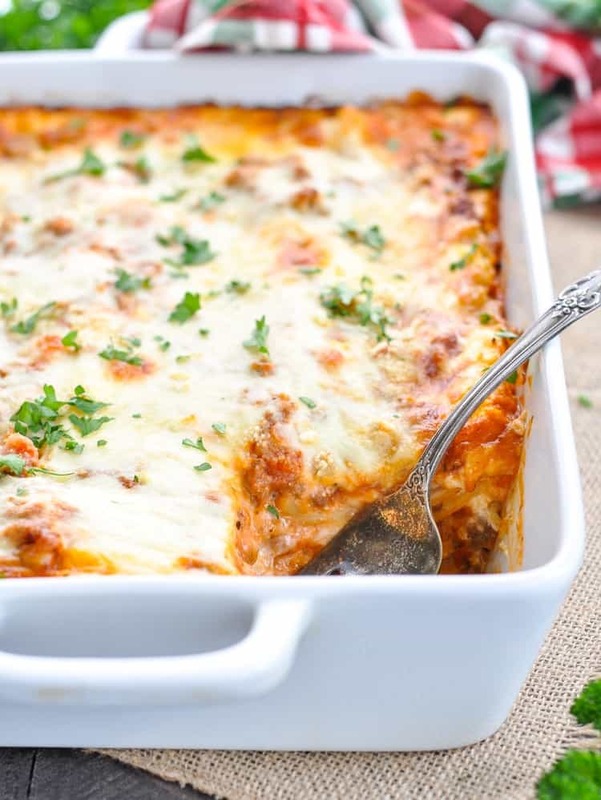 It’s the dish that Chi-Chi brought us for the freezer after each of our babies was born, and it’s the dish that I’ve prepared for my own boys at home when we just need a little bit of a lasagna “fix” before the holidays! It’s a simple lasagna recipe that requires just a handful of easy-to-find ingredients. Once the pasta noodles are cooked and the meat is browned, it’s really just a matter of assembling the casserole and popping it in the oven. I promise, this is easy! What ingredients do you need for lasagna? When I shared my Quick and Easy Vegetable Lasagna earlier this year, I mentioned that it was a healthier, vegetarian twist on my mother-in-law’s lasagna recipe. While so many of you have enjoyed my veggie-laden version, I’ve also received many requests for Chi-Chi’s meat-based original. That’s why I’m sharing it with you today! Like many of us, Chi-Chi doesn’t follow a specific set of instructions when preparing the dish, and instead eyeballs everything as she goes. 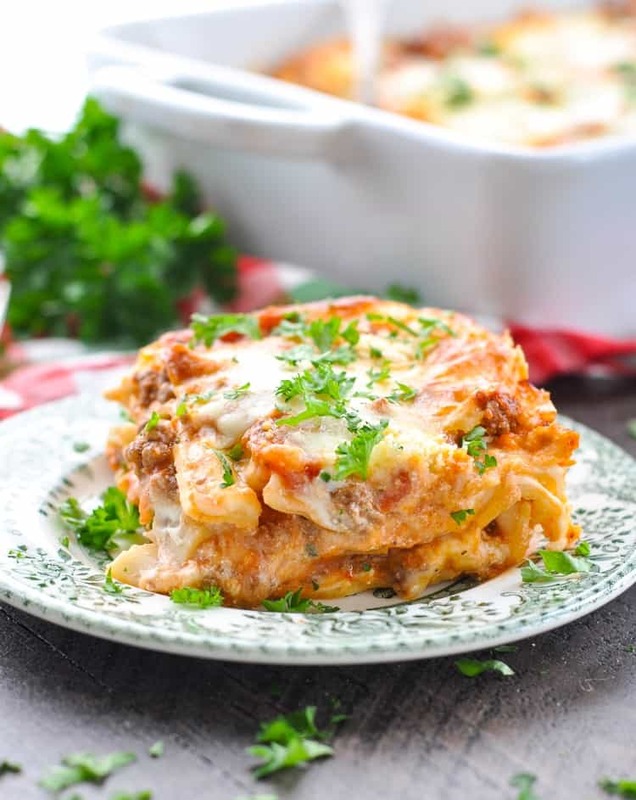 The Italian lasagna recipe includes all of the classic flavors and ingredients that you would expect (such as beef, ricotta, and mozzarella cheese), but it also uses a few unique twists to make the dish exceptionally good! Chi-Chi makes her sauce extra-creamy by stirring a little bit of Alfredo sauce right into the pan. You can’t taste it specifically, but you can tell that there’s something special in there! Her other favorite tip? Prepare the meat sauce with a combination of ground Italian sausage and lean ground beef. It adds SO MUCH flavor to the classic lasagna recipe! Assemble the lasagna in advance and freeze or refrigerate until ready to bake. Feel free to adjust the quantity of each ingredient, based on your personal preferences. If you love an extra cheesy casserole, add more mozzarella and more ricotta. If you prefer just ground beef instead of the sausage, then double the beef. I’m pretty sure that you can’t mess this one up, and I hope it becomes a family-favorite in your house this holiday season! This recipe will also work with ground turkey or ground chicken in lieu of the beef. Garnish with plenty of fresh parsley or basil for a bright addition to the baked casserole. Cook lasagna noodles according to package instructions. Drain pasta and use paper towels to wipe off any excess water. Lay the cooked noodles out in a single layer on foil. While the noodles cook, get started on the meat. In a large skillet over medium high heat, brown beef and sausage until no longer pink. Drain off fat and return cooked meat to the skillet. Stir in marinara sauce and Alfredo sauce. Spoon enough of the meat sauce into the bottom of the prepared dish to cover in a thin layer (about 1 ½ cups). Add a layer of noodles (about 3 noodles across). Spread a layer of ricotta (about ¾ cup) over the noodles. I find that it’s easiest to drop small spoonfuls of the ricotta all over the top and then use the back of a spoon or spatula to gently spread it in an even layer. Sprinkle a layer of mozzarella over top of the ricotta (I use about 1 cup of mozzarella per layer). Finish with a final layer of sauce, sprinkle with another 1 cup of mozzarella, and top with Parmesan cheese. Cover a large baking sheet with foil (to catch any drips), and place the lasagna dish on top of the foil. Bake lasagna, uncovered, for about 45 minutes (or until heated through). Allow the lasagna to stand for about 15-30 minutes before slicing and serving. *You can sub with a jar of regular Alfredo sauce if you can't find either of the brands that Chi-Chi likes. **I prefer to use a block of mozzarella that I grate by hand, because I find that it melts better than the pre-shredded packaged cheese. Either option will work, though! Cooking for a Smaller Family? Cut the ingredients in half and prepare the lasagna in an 8-inch square dish. You will have to cut or tear the lasagna noodles to fit the size of your dish, but that's fine! Cooking and baking instructions remain the same. Want to Prep Ahead? This is the ideal make-ahead dinner! Assemble the lasagna as instructed through Step 9. Cover tightly and keep in the refrigerator overnight or freeze for up to 3 months. When ready to bake, thaw the lasagna in the refrigerator overnight. Allow the dish to sit on your counter for about 30 minutes to come to room temperature, and then proceed with baking as instructed. Feel free to adjust the quantity of each ingredient, based on your personal preferences. If you love an extra cheesy casserole, add more mozzarella and more ricotta. If you prefer just ground beef instead of the sausage, then double the beef. I'm pretty sure that you can't mess this one up, and I hope it becomes a family-favorite in your house this holiday season! Holiday traditions are definitely the best! I look forward to those every year. I love that one of your traditions includes this lasagna on Christmas Eve. Looks amazing! I only make lasagna every so often because the recipe I use is pretty time consuming, so I will have to try this version. Love it! Thanks, Gayle! I don’t make this on a regular basis either, since it’s a bit more involved than my usual dump-and-bake meals! 🙂 That said, it’s still easy and it’s definitely worth a few extra minutes! For years I have included Lasagna with my Christmas Eve Dinner. This recipe sounds great: to make it even easier, use the no boil lasagna noodles (Barilla) adding extra sauce to cook the noodles. One more reason to look forward to Christmas, Merry Christmas to you and your beautiful family. Oh, have I already told you how big of a Lasagna fan I am? And I’m on a diet… ah I feel so unfortunate, seems like now I even have to plan my meals in a few weeks ahead.. My life’s quality has definitely dropped, hah, but anyway – I will try to prepare it in a week or two – looks extremely tasty, thanks a lot! I made this lasagna for Christmas Day. It is so amazing! We loved it! It definitely has a creamier texture rhan others I have had, in a good way. Thank you Blair for sharing this wonderful meal. Will be making it again.